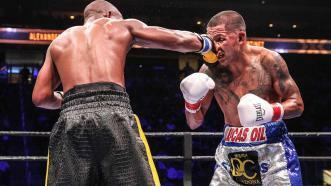 Mexican veteran Aron Martinez seized control midway through the 10-round bout and upset former two-division champion Devon Alexander in a unanimous decision. 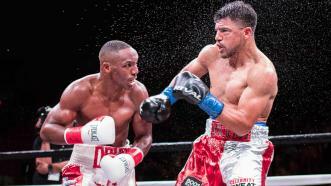 Aron Martinez pulled off an upset of Devon Alexander in a rugged war of attrition. 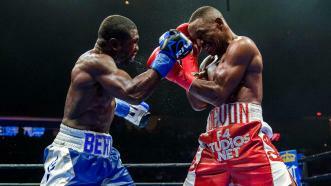 Former world champion Andre Berto (32-5, 24 KOs) won a back-and-forth fight by split decision Saturday night against fellow former champion Devon Alexander (27-4-1, 14 KOs) in the main event of Premier Boxing Champions on FOX & FOX Deportes from NYCB LIVE. 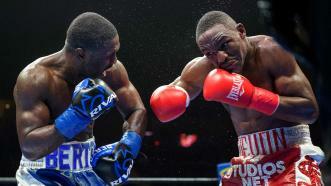 Former welterweight world champions Andre Berto and Devon Alexander "The Great" face off in a 12-round battle for 147-pound relevancy August 4, 2018 on FOX. Plus, former middleweight champion Peter "Kid Chocolate" returns to the ring to face once-beaten contender J'Leon Love in a super middleweight bout. 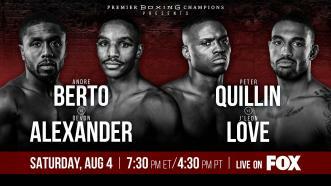 Former welterweight world champions Andre Berto and Devon Alexander face off in a 12-round battle for 147-pound relevancy August 4, 2018 on FOX. 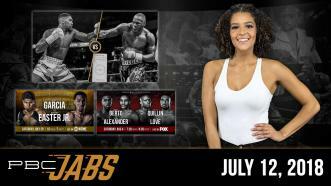 In this episode of PBC Jabs, WBC Heavyweight Champion Deontay Wilder checks in to give his side of the story regarding the Anthony Joshua fight negotiations. 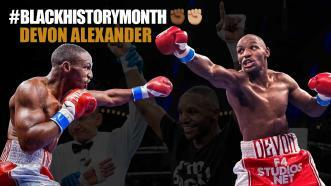 Plus, we preview our July 28th Showtime show and our August 4th FOX show. 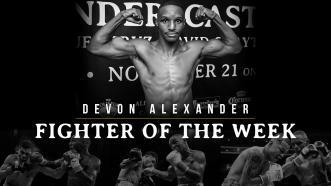 FIGHTER OF THE WEEK: Former two-division Champion Devon Alexander looks to take another step towards regaining a world title when he faces former welterweight titleholder Andre Berto August 4th on FOX. 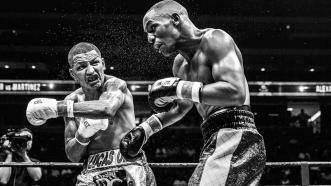 Devon Alexander tells us why Muhammad Ali is someone who helped pave the way for him and what he hopes to teach his children through his boxing career.